AIDED BY LIONS CLUB WORK: Randall H. Nelson of 1201 E. University Ave. (above), a doctoral student in political science at the University who was blinded by a German shell burst in World War II, is one of many sightless persons reaping benefits from a statewide program of Lions Clubs. 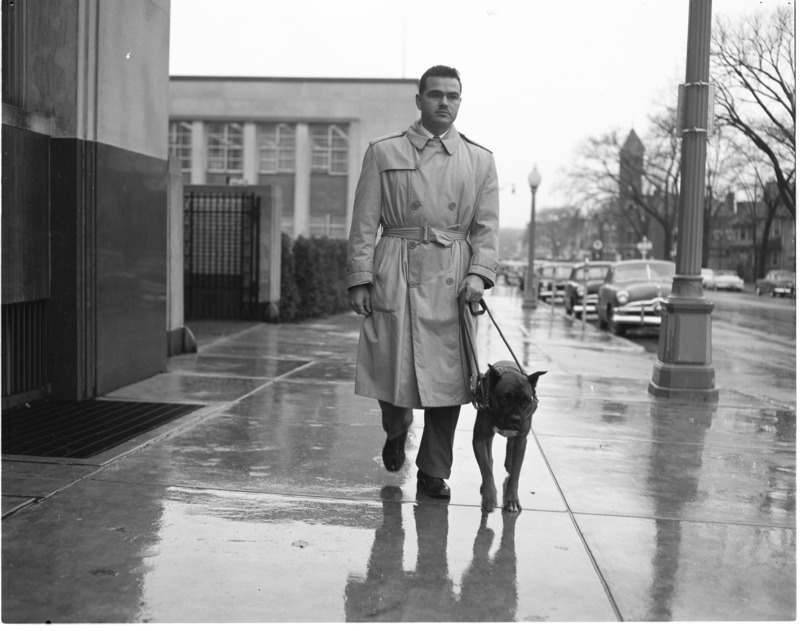 Michigan Lions, including those from the Ann Arbor organization headed by President S. D. Casey, contribute heavily to "Leader Dog" training at Rochester, Mich. Each dog, such as Sonny, the German boxer pictured with Nelson, costs an estimated $1,200 to train for the task of guiding a blind master. The dogs are purchased from the Leader Dog League for a token payment of $250.